*After obtaining the victory in the gruelling race from Poitiers, Gaston Van de Wouwer repeats this feat a second time with La Souterraine. His yearling hen, the ‘284-12′, won very convincingly the 1st Provincial La Souterraine against 1,588 yearlings, and was also the fastest pigeon of the whole Province of Antwerp. After the race from Poitiers, Gaston now only races with hens. That is why he kept more hens than other years, in a so called B-team consisting of hens that hadn’t flown so much but that all have an excellent pedigree and build. This year however, that B-team is achieving most of the top results because, besides the two winning hens, part of this team is the ’12-6023282’, that started with 31st from Noyon against 666 pigeons and 3rd from Dourdan against 720 birds, followed by 24th in the National Bourges against 13,588 pigeons… 89th National Chateauroux against 19,691 pigeons and 15th National Gueret against 15,007 birds. Gaston: “We have finished the first series of 7 national races. 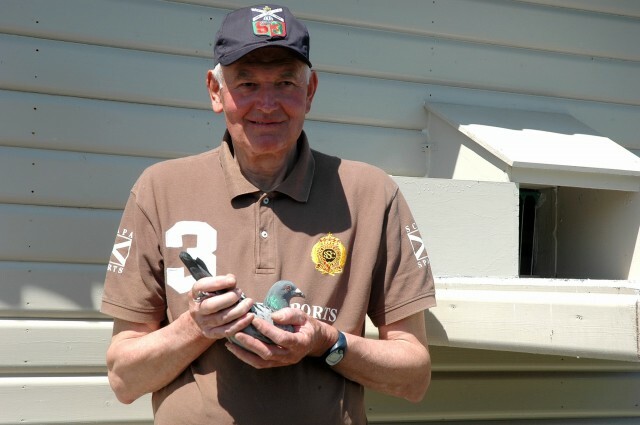 I will keep my so called B-team on widowhood, they will now first fly 2x Quievrain or Noyon and then Bourges-Chateauroux-Argenton, which are the races that still count for the national championship and for the Ace pigeon. I will give them extra light from now on, I have never done this before but I will give it a try. At present these hens have cast one flight. After the race from Brive, I will let the birds in the other loft build a nest, maybe I will race with these on young later. I am not in favour of the races from Brive and Souillac, and especially not for letting them count towards the program of the Long-distance club Antwerpen. These races belong to the long-distance racers, not to the long middle-distance. There are already enough races up to 600 kilometer. Many fanciers are dropping out of these races, or only enter their worst pigeons. Normally, I also enter two old hens in these races, just for the points. I’m now saying all kinds of things, but as every fancier will know, things can change very quickly.